Rishi Kapoor (born 4 September 1952) is an Indian actor, director and producer known for his work in Hindi cinema. He received the National Film Award for his debut role as a child artist in his father Raj Kapoor's 1970 film Mera Naam Joker (1970). Kapoor had his first lead role as an adult opposite Dimple Kapadia in 1973 with the film Bobby and received the Filmfare Best Actor Award in 1974. Subsequently, he played leading roles as the romantic lead in 92 films between 1973 and 2000, 41 of which were multi-starrer films. Only 11 of his 51 solo hero films were successful. For his performance in Do Dooni Chaar, he won the Filmfare Critics Award for Best Actor in 2011, and for his role in Kapoor & Sons, he won the Filmfare Award for Best Supporting Actor in 2017. He was honoured with the Filmfare Lifetime Achievement Award in 2008. He appeared opposite his future wife Neetu Singh in twelve films from 1973 and 1981. Rishi Kapoor was born in Chembur, Mumbai in a Punjabi family as Rishi Raj Kapoor. He was the second son of actor-film director Raj Kapoor and his wife Krishna Raj Kapoor (nee Chopra). He was also the grandson of actor Prithviraj Kapoor. He did his schooling with his brothers at Campion School, Mumbai and Mayo College, Ajmer. His brothers, Randhir Kapoor and Rajiv Kapoor; maternal uncles, Prem Nath and Rajendra Nath; and paternal uncles, Shashi Kapoor and Shammi Kapoor are all actors. He has two sisters, insurance agent Ritu Nanda and Rima Jain. Subsequently, only 11 of his 51 solo hero films were successful at the box office, and 25 of the 41 multi-hero films were successful at the box office. Rishi Kapoor had 51 films as the solo lead hero from 1973 to 2000, but 40 of them were box office flops and only 11 managed to be hits. These were Bobby , Laila Majnu (1976 film), Rafoo Chakkar , Sargam, Karz, Prem Rog, Nagina, Honeymoon, Chandni, Heena and Bol Radha Bol. Ye wada raha He had the lead hero roles in two-hero films only 13 times, in Khel Khel Mein, Kabhi Kabhi, Hum Kisise Kum Naheen, Badalte Rishtey, Aap Ke Deewane, and Saagar, and then from 1989 with Ajooba, Chandni, Deewana (1992), Damini - Lightning (1993), Gurudev (1994), Daraar (1996) and Karobaar (2000). Generally in the multi-hero films Rishi did in the late 70s and throughout the 80s and early 90s, his other co-star's character and performance over-shadowed his, and was more appreciated, such as in the case of the films like Naseeb, Katilon Ke Kaatil , Coolie, Duniya, Sitamgar, Zamana,Ghar Parivar and Amar Akbar Anthony. In 1999 he directed the film Aa Ab Laut Chalen, starring Rajesh Khanna, Aishwarya Rai and Akshaye Khanna in the lead roles. His last film as a romantic lead was the delayed Karobaar: The Business of Love (2000). Rishi Kapoor acted in Heena, directed by his brother Randhir Kapoor and his father, Raj Kapoor, and in Prem Granth, a movie produced by the three Kapoor brothers (Rishi, Randhir and Rajiv Kapoor) and directed by Rajiv Kapoor. He moved on to supporting roles in the 2000s. He has since appeared in films such as Yeh Hai Jalwa (2002), Hum Tum (2004), Fanaa (2006), Namastey London (2007), Love Aaj Kal (2009) and Patiala House (2010). He also appeared in the British films Don't Stop Dreaming (2007) and Sambar Salsa (2008). He reunited onscreen with Neetu Singh in the film Do Dooni Chaar (2010). He also acted in the movie Chintu Ji in which he played himself. In 2012 he appeared in a villainous role in Agneepath and in the multi-starrer Housefull 2 where he appeared with brother Randhir Kapoor for the first time after Khazana in the mid-1980s. He made a cameo appearance in Yash Chopra's Jab Tak Hai Jaan along with his wife. His latest film 102 Not Out is a comedy-drama film directed by Umesh Shukla. It brought Amitabh Bachchan and Rishi Kapoor together for the first time after 27 years. The film is adpated from a Gujarati play also titled '102 Not Out' written by Saumya Joshi. The film received mixed reviews. Kapoor married actress Neetu Singh his 15 time co-star on 22 January 1980. The couple has two children - actor Ranbir Kapoor who was born on 28 September 1982 and designer Riddhima Kapoor Sahani, who was born on 15 September 1980. Rishi is the paternal uncle of actresses Karisma Kapoor and Kareena Kapoor, and maternal uncle of industrialist Nikhil Nanda. Rishi Kapoor has been in controversies for his comments on social media. Rishi Kapoor's autobiography Khullam Khulla: Rishi Kapoor Uncensored, was released on 15 Jan 2017. Kapoor wrote the book along with Meena Iyer, and the title was published under Harper Collins. 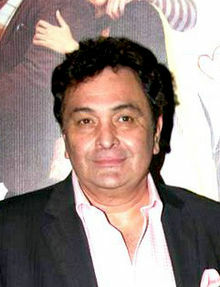 Wikimedia Commons has media related to Rishi Kapoor. ^ "Rishi Kapoor slams godmen and Radhe Maa". ^ "Latest News, Breaking News Live, Current Headlines, India News Online". The Indian Express. Archived from the original on 7 September 2013. ^ a b "Proud of Ranbir's choice of roles: Rishi Kapoor - Latest News & Updates at Daily News & Analysis". 15 September 2012. ^ Gooptu, Sharmistha (29 October 2010). "Bengali Cinema: 'An Other Nation'". Taylor & Francis – via Google Books. ^ "Fashion Cultures: Theories, Explorations, and Analysis edited by Stella Bruzzi, Pamela Church". ^ "South star Taapsee surprises Rishi Kapoor by turning out to be Punjabi - NDTV Movies". ^ "Top Earners 1970-1979". Boxofficeindia.com. Archived from the original on 14 October 2013. Retrieved 2011-06-01. ^ "Since then he played leading roles as the romantic lead in 92 films which includes 41 were multi-hero films and 51 solo hero film". 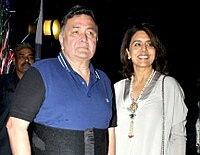 ^ "Rishi Kapoor vows to donate organs". ^ "Tweets on beef land actor Rishi Kapoor in controversy". ^ "Rishi Kapoor: I am a Beef eating Hindu, don't equate food with religion". ^ "Rishi Kapoor faces cow vigilantes' ire for tweets on eating beef last March". ^ "Rishi Kapoor honored by Russian Government for contribution to cinema". Bollywoodhungama.com. 9 November 2009. Retrieved 19 September 2011. ^ "Winners of 5th Apsara Film & Television Producers Guild Awards". Bollywoodhungama.com. 8 January 2010. Archived from the original on 6 April 2010. Retrieved 19 September 2011. ^ "Winners of Zee Cine Awards 2011". Bollywoodhungama.com. 14 January 2011. Archived from the original on 22 October 2011. Retrieved 19 September 2011. ^ "Priyanka, Ranbir win best actor awards at TOIFA". intoday.in. 8 April 2013. ^ "Winners of Times Of India Film Awards 2013 (TOIFA)". bollywoodhungama.com. 8 April 2013.